This is the second part of a two part series on buying used sweepers. Part one in the last issue of North American Sweeper educated the reader on what to look for when buying used. 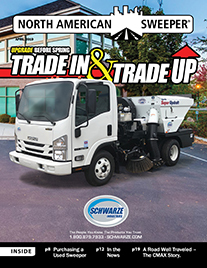 In this month’s edition part two will discuss other factors to consider including the original manufacturer, access to OEM parts, typical deal killers and tips on maintaining a used sweeper. One major factor in determining the value of a used sweeper is the sweeper’s manufacturer. Certain manufacturer’s used sweepers command a greater resale price than others. 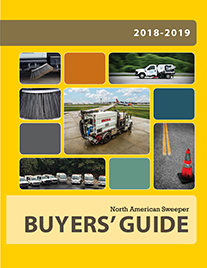 Many contractors will only buy one or two particular makes of equipment, and brand loyalty reflects in annual sales in used sweepers as well as in new equipment. Contractors are often willing to pay more for a brand name that they’ve had good results with and are satisfied with the brand’s performance and retention of value. Multiple sweepers of same make and model allow for more spare part compatibility as well. Spare parts, filters, brooms can be used on multiple units requiring less inventory. Brand loyalty significantly reflects in used equipment sales. The name often implies quality and reliability. That is something purchasers of Schwarze brand products know all too well. 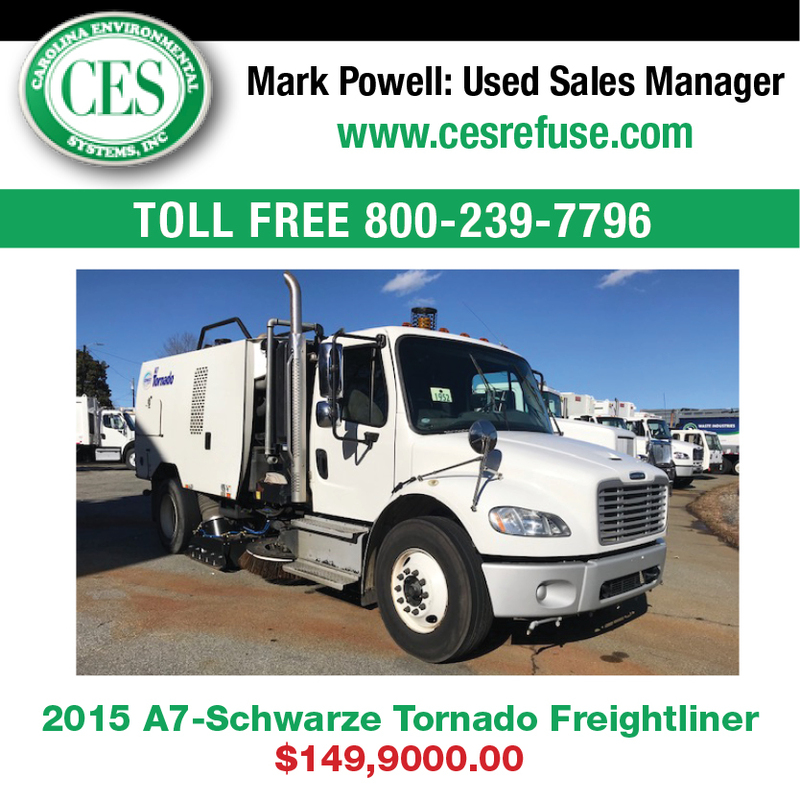 Some manufacturers like Schwarze Industries offer trade-ins of used sweepers for the purchase of a new sweeper. “All of our pre owned sweepers go through a 51 QA inspection sheet that is recorded for every sweeper that we run through the shop,” says Ren Cramer, Reconditioning Center supervisor. The Schwarze Reconditioning Center also has access to dealer techs on site. “Used sweepers get the same treatment as a new sweeper rolling off the production line. 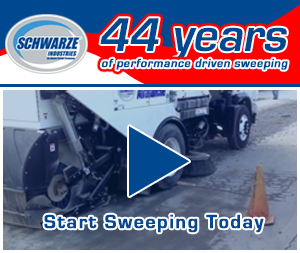 When the sweeper has gone thought the shop it is released to Schwarze’s QC team. They inspect the sweeper, drive it and sweep with it . Imperfections are documented and our Schwarze technician will do the final repairs. QC will look the sweeper over one more time to make sure the repairs where done properly. It’s traded in as a used sweeper. When we complete the repairs and reconditioning it becomes a pre owed sweeper and is ready to sell. The manufacturer of your sweeper matters, and so does the manufacturer of the replacement parts for that sweeper. 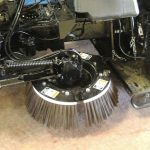 When you’re considering a used sweeper, check the manufacturer of any of the replacement parts. If possible, choose equipment with replacement parts manufactured by the original equipment manufacturer (OEM parts). These parts are specially engineered to work with your equipment, and will allow the machine to be used to its full capacity. Another benefit of OEM replacement parts is financial. Many manufacturers and dealers offer warranties that cover only the use of OEM replacement parts. If the seller used off-brand replacement parts, you may find that your warranty is invalid through no fault of your own. Look for an older version of equipment that’s still made by the manufacturer today. Such as the Schwarze S348/S350 (now called Gale Force) or S347 (Vortex) as you’re more likely to find parts for these sweepers as your machine ages. – Used OEM parts, often sourced from other equipment. For older used sweepers, you may need to rely on used parts sourced from other vehicles. It’s easier and less expensive to source used parts for popular models than it will be to source them for rare models. When a manufacturer still makes the equipment in question, you will be able to source new parts as well as used. This gives you a wider range of choices. Some manufacturers, like Schwarze, continue to provide parts for sweeper models it no longer makes. When it comes to the life of a sweeper, the miles and hours are usually the first things people check. However, a newer used sweeper isn’t always better than an older used sweeper. We have seen some well-maintained sweepers last for twenty or thirty years. It’s true that a sweeper that has more miles has more wear and tear, but a sweeper that has been used less could be in worse shape. Parts that don’t get regular use can become brittle and break more easily. – Difficulty starting the engine. – Smoke near the engine when it starts or if the third gear in the transmission doesn’t operate, those are signs of major problems. – Oil leaks on the equipment or underneath the equipment. – Coolant in the oil or vice versa. – High system temperatures, which can be early warnings of fluid contamination. – The appearance of foam in fluid reservoirs. – Structural problems, like cracks in the frame or plated areas. These are signs of major structural damage to the equipment. – A freshly painted hopper may be covering up recent repairs where bondo was used to fill rust holes. If the hopper is freshly painted and the rest of the sweeper looks bad, it probably needs a new hopper. It’s common to see signs of cosmetic damage or small dents on the sweeper, but there’s a big difference between regular wear and tear and neglect or bad maintenance. Used sweepers that have been well maintained shouldn’t have any major oil leaks, engine problems or fluid contamination. – Maintaining and Servicing Your Equipment Regularly – Preventative maintenance is key to keeping your equipment operating. Maintaining a regular maintenance schedule will reduce downtime and prevent unexpected major repairs. Preventative maintenance can also have a big impact on your equipment’s resale value. – Fluid checks & filter replacement – Regular fluid checks and replacing your filters regularly can go a long way. Make note of the manufacturer’s recommended services for key components, and schedule those services for equipment downtime. – Regular Lubrication – Lubrication plays an important role in any machinery function. It reduces friction. When you use good quality lubricants, it will easily increase your sweeper’s life-span and performance. Also, always follow the recommendations and guidelines regarding the choice of lubricant. – Storing Your Equipment Indoors – If you’re fortunate enough to have the facility to accommodate storing your sweeper indoors, by all means do so. That alone can add years to it’s life and save you thousands. The elements can wreak havoc on a sweeper, drying out seals, cracking the dash, fading paint, etc. The last but not least, insure your sweepers are only operated by individuals that have received proper training. An untrained operator can be a danger to himself and to others. At a minimum they can destroy your equipment if not operating it properly. You have too much invested to risk that.